It’s important to understand when your horse becomes nervous in order to address the behavior. Does he get excited only when he’s left alone or at an unfamiliar place? Or does he spook on a regular basis when you ride, even in familiar surroundings? If he’s regularly a tense and excitable horse, that might just be his personality. Many people often think of Arabians or Thoroughbreds for that type of behavior, but any breed of horse may be super alert, spooky or skittish. Age and gender may also affect your horse’s behavior; younger horses tend to be more hyper than mature horses. Many mares have hormonal swings during the spring that can make them difficult to ride. Diet can directly impact your horse’s energy and state of mind. Foods with high sugar and starch levels, such as concentrates, can rile up even the calmest equines. Put your horse on a diet with more fiber-enriched foods, like roughage, to help mellow him out. Overfeeding your horse compared to his activity level can also create an energetic horse. If you feed your horse a performance grain, but he only gets ridden 3 times a week with minimal turnout, he may be receiving too many calories with a lack of adequate means of expelling his energy. Examine your horse’s living arrangements. If you have a young, high-energy equine who spends much of his time in a box stall, this may not be conducive to his behavior. 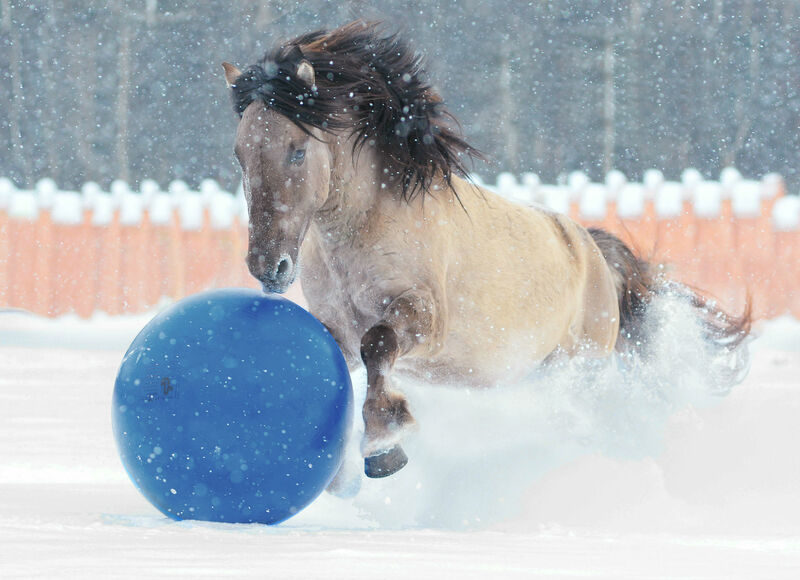 Young horses need to spend time outside where they can burn off pent-up energy. Adding a steady stable buddy can also help take the edge off. Stable buddies can be any calm animal; many race horses travel with companions like goats, dogs or chickens. Medical and behavioral problems can contribute to a horse’s skittishness as well. A vision problem can make him hesitant about going from a light area to a dark one and can cause him to jump when something flashy catches his eye. A horse with back problems may get tense or jumpy when being tacked up or ridden. 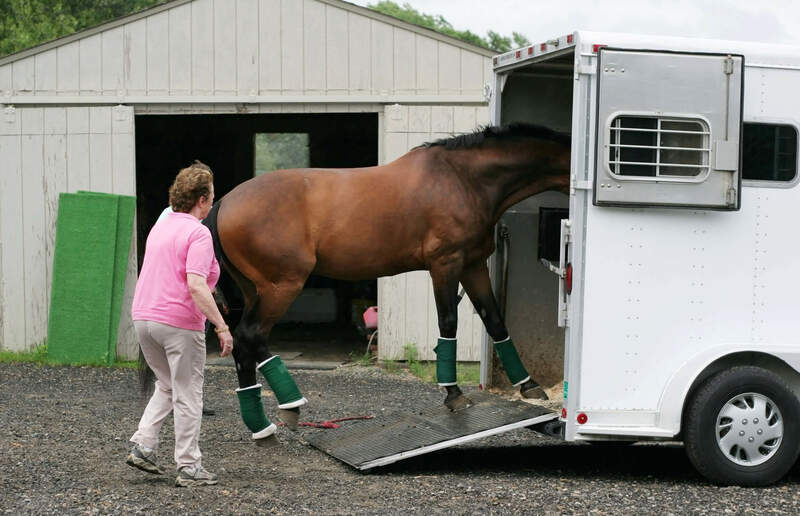 If your horse has had a bad experience in a trailer or indoor arena, those places may make him panic. Veterinary visits or farrier care may also be stress triggers. Being aware of when, where and how your horse acts up will help you determine the root cause. Depending on the reason behind your horse’s spookiness, calming supplements may provide some relief and make your horse easier to manage. If there is a stressful event on the horizon for your horse, test a calming supplement on him before the day of the event. Different calming supplements can work very well on some horses, but not on others. If you will be participating in a show or competition, make sure to check the association rules and regulations to see if there are any restrictions against the ingredients used in the calming supplements. Some equine organizations ban substances that include popular ingredients found in calming supplements. How Do Calming Supplements Work? Serotonin is a “feel good” hormone and neurotransmitter found in the central nervous system that creates feelings of relaxation and contentment. The body requires an essential amino acid called L-tryptophan to form serotonin. L-tryptophan is found in grass and pasture, although it may not be present in large amounts. Giving your horse a calming supplement with tryptophan, like B-Kalm™ Calming & Focusing Paste, will not provide him with an immediate boost of serotonin; rather the effects will likely take place within 1.5 – 2 hours and last for about 8 hours. Since tryptophan is found in the horse’s body, it can be used daily to help your horse overcome a traumatic experience or ease his show nerves. Minerals like magnesium and calcium, and vitamins such as vitamin B1 (thiamine), may also be included in calming supplements, but their effectiveness has mainly been proven anecdotally. It’s important to note that feeding excess magnesium and calcium could have adverse effects on the growth of young horses, so it’s always best to consult your veterinarian before adding these types of supplements to your young horse’s diet. Other ingredients that can be found in calming supplements include chamomile, valerian, inositol and taurine. Evaluate your excitable horse to better understand when and where he becomes nervous. He may need a change in diet, a better exercise schedule or more time outdoors in order to release some of his excess energy. If you feel a calming supplement may help your horse, a tryptophan-based supplement is a good place to start.